SAN FRANCISCO (NET Radio) - Editor’s Note: This Signature Story was reported by QUEST Northern California and is the second in a four-part series, “Coal at the Crossroads” exploring coal in the U.S. This series is produced in collaboration with QUEST Northern California (KQED San Francisco) and its partner public broadcasting stations. For more QUEST Nebraska stories visit netnebraska.org/quest. Massive coal-fired power plants aren't something you'll find within California's borders. To find the source of the state's coal power, you have to go to places like northern New Mexico, where the San Juan Generating Station is located. "We currently have unit four offline, but units one, two and three are operating at full load," said Pat Themig, Vice President of Generation for PNM, the New Mexico utility that runs the plant. "If you see the line where the stack is, everything going behind that is scrubber," he said, pointing past a towering smokestack. Those scrubbers remove pollutants from the air emissions. But PNM has struggled to meet air quality standards and last month, the Environmental Protection Agency ordered the plant to install new pollution control equipment. Those costs are generally passed on to the power plant owners, which, in this case, are utilities in Arizona, New Mexico and California. The San Juan Generating Station supplies power to several California cities and the Southern California Public Power Authority. "People would be very surprised to know, particularly in Los Angeles, that historically, more of our electricity comes from coal fired power than from any other source," said Evan Gillespie of the Sierra Club's "Beyond Coal" campaign. "Several decades ago, Los Angeles made a number of bad bets on coal fired power plants - that that would be the way of the future. That has clearly turned out to not be the case," he said. Gillespie is talking about one particular utility: the Los Angeles Department of Water and Power (DWP). It's the largest municipal utility in the country. "We get about 40 percent today from coal and that is all out of state coal," said General Manager Ron Nichols. It comes from two coal-fired power plants, the Navajo Generating Station in Arizona and the Intermountain Power Project in Utah. Historically, coal has been attractive to utilities for two reasons: it's reliable and cheap. "Coal tends to come around 5 to 6 cents a kilowatt hour. Our renewable portfolio today is around about 11 cents," said Nichols. But that's changing, according to Nichols and most of the energy industry. Renewable energy is getting cheaper, while coal is getting more expensive due to stricter air pollution rules. Two years ago, Los Angeles Mayor Antonio Villaraigosa set a goal for DWP. "I'm directing the CEO of the Department of Water and Power to take every action necessary to reach these goals and eliminate the use of coal by 2020," he said. Meeting that 2020 goal isn't something DWP managers have committed to. That's because DWP's contract with the Utah coal plant isn't up until 2027. Nichols said ending it early is difficult because they have to negotiate with the plant's many owners. But perhaps the bigger challenge is this: that coal power has to be replaced with something else. "Within a decade and a half, we're going have replaced on the order of 70 percent of our total power supply. And for a utility that thinks in decades, that's rocket fast," Nichols said. DWP must generate a third of its electricity from renewable sources by 2020, according to state law. But the problem with solar and wind power is that it fluctuates. The sun doesn't shine all the time and the wind stops blowing. Utilities often use electricity from natural gas power plants to fill in power gaps. But DWP has a problem there too. 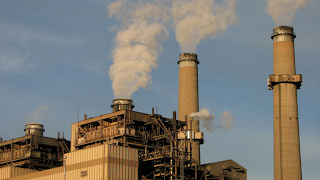 DWP relies on three coastal natural gas power plants, including the Haynes Generating Station in Long Beach. The 1800-megawatt power plant was built more than 50 years ago. "If we walk out here, I'll show you how we get the ocean water," said DWP projects manager Nazih Batarseh. "For these old power plants, we use ocean water for cooling. And then we return it back into the ocean." The technique is known as once-through-cooling. Everyday, almost 700 million gallons of seawater is pumped through power plant. That water holds fish larvae and plankton that die in the process. So last year, the State Water Resources Control Board ruled that coastal power plants must switch to a new cooling method over the next decade. "It's a huge project," Nichols said. "It is something that requires us to take plants down, plant by plant, and completely rebuild them. And those are plants that are key to our reliability." He said rebuilding three natural gas plants will cost DWP $2.2 billion dollars. The utility recently convinced the water board to give it an extension to 2029. Add that to investing in more renewable energy and moving away from coal power and it's a challenging time for the utility. "It is a transition that every utility in the country will make said," said Evan Gillespie of the Sierra Club. Gillespie said Los Angeles's challenges are a snapshot of what utilities around the country will be facing as the country gradually puts national global warming rules in place. And he said those that embrace renewable energy first will benefit the most. "A lot of these investments, while they create a lot of jobs, jobs that we desperately need, these are also investments that are going to modernize the utility," he said. "And I think the opportunity here in Los Angeles is to help provide that roadmap to help these other utilities around the country manage that transition." Good news! I am really happy to hear about your new opening! I hope that this will be a good decision for you!